Note: This blog post was co-authored by Zohal Azimi, a student at SUNY Farmingdale State College studying visual communications, and Shaimaa Lazem, a researcher at the City for Scientific Research and Technology Applications, Egypt. HCI research plays an important role in designing interactive systems and development worldwide. There is an increased awareness of and interest in designing for Arabic regions and cultures within HCI, yet current studies can often address “Arabs” as a single entity. There is therefore a need to reflect the diversity of the Arabic regions and the uniqueness of Arabic cultures that affect technology design. As researchers with in-depth knowledge of the Arabic regions, who are, or have experience of, studying and working within the U.S. and the U.K., we want to focus on design research that reflects our interests and concerns in designing for the Arab world, including countries where Arabic culture and language is prevalent and regions where Arabic communities are growing. With this in mind, we established the ArabHCI initiative in 2016 to empower, bridge, and connect HCI researchers and practitioners from the Arab world with those who are already working in or interested in this context. Our aim is to establish a community of HCI researchers interested in the Arab context to leverage their “insider” understanding and explore the challenges and unique opportunities in technology design. We organized several activities to start working on this aim: A SIG meeting was held at CHI’17 to discuss key points on current HCI research across the Arab world, followed by a networking dinner. As the initiative leader, I (Ebtisam) was invited to share my vision and give talks about our mission to increase awareness of the status and opportunities of HCI education and research in the Arab world. This took place at the Diversity Lunch at CHI’17 and will also take place at the forthcoming INTERACT’17. Moreover, to promote ArabHCI discussions, a series of “Tweeting Hours” was scheduled to share ideas and experiences regarding specific aspects of HCI research in the Arab context. The outcomes of these events emphasized the demand to establish a community and encouraged us to plan future events. Informed by this feedback, we eagerly brainstormed a precise agenda for a Design4Arab workshop at DIS 2017 in Edinburgh. Seventeen individuals ranging from students, researchers, and professionals registered to attend. Our diverse group of participants was experienced and interested in working within the Arab context and included a 10:7 Arab to Non-Arab ratio. The diverse backgrounds and experiences of the attendees enriched the discussions around technology design. Participants came from all over the world, including the U.K., Germany, and the U.S., and had submitted a wide range of position papers (available on ArabHCI.org). Some papers highlighted the challenges and experiences we face as a community when it comes to designing interactive systems in Arab regions, such as the lack of participatory design. Other papers shed light on design-focused opportunities; for instance, how to design marital matchmaking technologies in Saudi Arabia, or how to design for disabled people in Jordan. 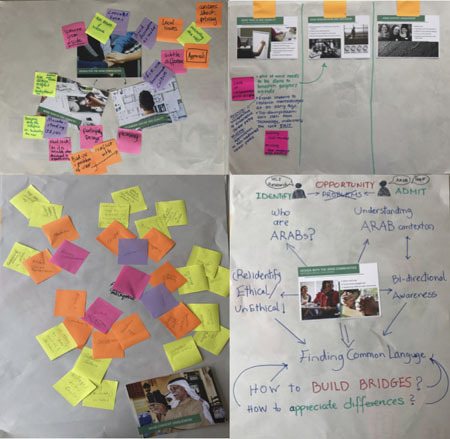 Throughout our one-day workshop we had intriguing discussions around designing interactive systems and how to confront the emerging design challenges in Arabic regions. We started with lightning talks presented by the participants based on their experiences that helped us foster a better understanding of HCI research and identify the most pressing needs in the Arab context. Anne Webber from the University of Siegen called on designers to develop digital platforms for refugees and “work with the people, rather than design for them.” This goes hand in hand with our initiative. We should be designing for diversity while designing interactive systems to connect refugees, migrants, and the local volunteers and professionals aiding them. Franziska Tachtler from the Vienna University of Technology introduced an interesting perspective, saying, “I wonder if there are any experiences of using participatory design in the Arab world, as this has been used in the West.” We need to join together as a community to adopt some new, practical, and suitable methods of research for designing interactive technology with the Arab world. Consequently, this will help us to address unique needs, such as understanding different cultural backgrounds and involving the user sensitively in the design process. This will also promote more participatory design adaptation and reduce top-down design processes related to politics and governance within these regions. The remaining sessions focused on exploring challenges and opportunities in collaborations between participants. We split into four groups of approximately five to have open discussions about the contextual and methodological challenges facing HCI studies in the Arab world. Each group was given six thematic cards with a probe list relevant to the card topic to facilitate their discussions. Some things we noted were that when designing for the Arab world, we should delve into the design process and learn how to successfully design technology that reflects the Arab culture and values, Arabic language, and the various dialects. We pointed out that when designing, we should not start from technology; rather, we should start with understanding the specific Arab users first. We need to ask ourselves, who are the specific people we seek to design with and for? How do we engage Arabic users in ways that show respect for cultures? How do we design sensitively that respects differences in gender and age? How do we account for a variety of concerns associated with security and privacy? The groups shared other ideas and created visuals to develop an insider understanding of these problems. We identified that HCI researchers need to engage more Arab communities in research practices in order to gain a deeper understanding of these issues. After going around the room discussing the challenges, it was time to explore what design opportunities there are. Putting our heads together was enlightening, as it helped us dig deep into the problems that current HCI researchers might overlook while designing technologies for the Arab world. It sparked ideas and specific design opportunities on how to serve specific needs. One group’s goal was to increase autonomy in kids to express their design ideas with one another and help them present their ideas to their peers. The result was a social platform to bring kids from the local neighborhood together to build on their design ideas and proposals, producing inclusive design projects for kids in different Arab countries. Another group suggested designing a game to help young girls understand the struggles of teenage girls transitioning to young women. We also had another group propose ideas on how to improve the education system for toddlers, with the designs differing for each specific Arab country. It was interesting to work with HCI researchers who are not from the Arab region, as they do not always fully understand the diversity and differences within the Arab context. It was fascinating to see everyone courageously discuss their thoughts and ideas, even when they didn’t agree. As we were discussing the concept of supporting teenage girls, the groups suggested involving parents so they can become educated and have open conversations with their daughters. Some of the Arab participants recommended that their proposal should be directed toward all “mothers,” instead of all “parents.” They stated that it is very unlikely for a father to be involved. It was not only that fathers will not want to be involved but also that daughters will more than likely avoid involving their fathers in such embarrassing discussions. The initial group responded with a non-Arab participant saying that any design should involve education for Arab fathers, just as much as for Arab mothers. This friendly disagreement showed us how important it is to conduct extensive research in the Arab context, to reflect on the wider social expectations when designing, and to consider how technology might be used to intervene and the impact it might have. This whole experience has truly given us unforgettable and noteworthy outcomes. It was important for everyone to hear different voices from all over the world openly express their perspectives on Arab HCI. We were fortunate enough to have interested participants who showed us the importance of collaboration between HCI researchers from the East and the West. By going in depth into current and possible challenges, it also helped us analyze Arab HCI research and break it down into what it is now and what it could be in the future. Our community is still growing, and we are striving to move forward on this journey together. For more details about the ArabHCI initiative and to follow the upcoming events, please visit https://arabhci.org.